This year I made a point of adding to my collection of holiday music with what I'm calling Novelty Character Albums. What I mean is, albums where most of the gimmick is that the songs are being sung by fictional characters. I, honestly, love character-based Christmas music. There are so many seasonal songs that are good no matter what, but when, for example, the Muppets sing them, they become transcendent. The first one I'm looking at is also the oldest (date on the CD notwithstanding). The Chipmunks have been a novelty act since the 1950's, and their hit holiday song won a Grammy at the very first Grammy Awards. So for historical purposes, I had to get one of their compilations. 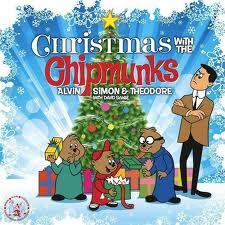 The company that owns The Chipmunks has been putting out different combinations of holiday songs since 1961, generally just re-combining and re-releasing the same tracks. So even though this CD was technically released in 2010, the recordings are all from the 60's. Of course it features their headline track, The Chipmunk Song, but overall it's a decent selection of songs. The album starts strong, with a little introduction before the first song (many character albums have this) but the jokes in the music get repetitive pretty quickly. I really like the first song, Here Comes Santa Claus. It made me laugh. The first time Alvin speak-sings a verse with mock-gravity it's pretty fun, but when a similar gag is used later, it's less interesting. This CD would probably be better blended in with a bunch of other disks, not listened to by itself. A little Chipmunks is fun, but a little goes a long way. Some of the tracks are great. I mean, they do ALL THE VERSES to Jingle Bells! Nobody does that! There's a nice lightly jazzed-up beat to this version, too. Plus this is the only version of Over the River and Through the Woods in our collection, which was surprising. Also that song has more lyrics than I remembered, and they add some bridges to extend the song and make it more Christmassy. I approve. Fun 12 Days... Like all good versions of this song, there's a decent number of layered jokes to keep you interested, including occasionally singing the wrong lyrics on purpose. Deck the Halls has one of those "now you sing at home, kids" sections, which is not surprising. I found this version of White Christmas particularly cornball, and it's too bad that it was chosen to end the CD; it would have been better to close on Have Yourself A Merry Little Christmas. Final judgement: fun, but use in moderation. Any recording of "All I Want For Christmas" is an absolute travesty. That song is the lurking album-murderer of any Christmas record. Sam: I agree in general, with two notable exceptions. Dread Zeppelin has a re-imagined version that's really cool, and The Count has a great Transylvanian version on "Merry Christmas from Sesame Street." Other than those, the song is a blight upon the holiday.